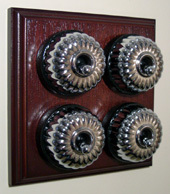 Pattress - A decorative wooden mounting for period light switches, sockets, and other electrical accessories. Period Pattresses craft and supply high quality oak pattresses, either individually, allowing you to source your own light switches or other electrical fittings, or as a package with authentic reproduction period light switches or sockets fitted. The switches and sockets may also be purchased separately. Oak Pattresses are available in 4 standard sizes, for 1 to 4 light switches, and 2 standard circular sizes for mounting a single switch or socket. A bespoke service is available on request for any non-standard requirements. Oak has been used for centuries due to its intrinsic strength and natural beauty, and it makes the perfect mount for electrical fittings. We use 20mm thick, high quality kiln dried oak in a choice of 3 different grades, allowing you to choose the level of character you desire. Danish oil is used to prime, seal and finish the oak, enhancing the natural beauty of the wood. We also stock Pine and Mahogany pattresses. The Pine is untreated allowing you to choose your own stain or paint finish. The Mahogany pattresses are made from MDF, with a Cedar veneer and Mahogany stain, and laquered for a smooth and durable finish. These pattresses are not made by Period Pattresses, yet we are offering them to our customers as we understand that not everyone would like oak! Don't ruin the look of your home with ugly, modern electrical fittings! Our pattresses, complete with period light switches and sockets, will be the perfect finishing touch to your period property! Why Buy From Period Pattresses? 1. Our pattresses are individually crafted, and are not mass-produced. They therefore have a much more authentic appearance. 2. We offer 3 grades of oak, allowing you to choose the level of character to suit your requirements. 3. The proportions of our pattresses perfectly complement period style dome switches. 4. PRICE! Our prices reflect very favourably against competition. We can save you a considerable amount of money, whilst providing you with a superior product. Refined Grade - For customers with a "cleaner" requirement. Generally straight grain, with an even colour. Only occasional small drying splits or knots. Character Grade - This grade has a more varied grain structure, with small knots, burrs and surface shakes, slight drying splits, and more colour variations. Rustic Grade - Full of character. Pronounced grain patterns, large knots, & drying splits. Wide variations in colour. Please note, that due to the natural qualities of oak, no two pattresses are the same, which gives each one a unique appearance. Due to this, grading can sometimes be subjective, therefore we place each pattress in its most appropriate grade, using the above as a guide.